With the introduction of new software upgrades, Zetec’s recently launched TOPAZ™ portable ultrasonic Phased Array flaw detector is now even more integrated, offering a versatile, productive and user-friendly solution to non-destructive inspection tasks. The new upgrades offer significant additional features, reinforcing TOPAZ’s claim to be the world’s first fully self-contained and integrated, phased array inspection instrument, ensuring that users enjoy better probability of detection (POD), higher productivity and enhanced inspection reporting. 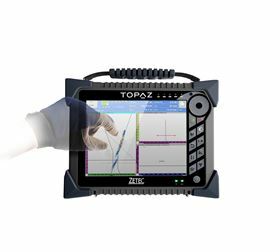 The robust and powerful TOPAZ™, with its multi-touch interface, comprehensive connectivity and its ability to operate in temperatures up to 45°C, is already enjoying success throughout the entire industrial spectrum. The new software upgrade now consolidates its stand-alone capabilities by providing on-board guidance, calculation and operation through the total inspection process from preparation and set-up to reporting. Fast and easy set-up begins with specimen and weld preparation. All types of plate, pipe are visually simulated on the instrument’s ultra-bright screen. For weld inspection, the software displays the type of weld to be inspected. TOPAZ™ will then allow the user to virtually position the probes on the specimen to ensure optimum volumetric coverage. The on-board calculator will calculate the focal laws for each probe. Calibration is a simple process, where the user is guided by a calibration wizard, with no need to carry out multiple operations using the Graphical User Interface (GUI). TOPAZ™ provides data acquisition in real time. Data can be displayed in a range of views, from simple A-, B or C-scans, phased array and TOFD , to real-time corrected, merged views, with no need to convert or post-process data., allowing the inspector to make fast, accurate decisions. All analysis is carried out on board, with innovative features to enhance Phased Array and TOFD inspections. The instruments data sampling technology allows high amplitude resolution, which permits the efficient use of software gain during analysis and mitigates the risk of signal saturation, which can be the cause of time-consuming re-scans. The powerful analysis software also has the ability to handle different inspection views and indications and possible defects are automatically added to a table of indications, eliminating manual tabulation. Headquartered in Snoqualmie, Washington, with its centre of ultrasonic inspection excellence in Quebec and with offices in Paris, Seoul, and Shanghai, Zetec has provided solutions for mission-critical inspections for over 40 years. It is a company committed to continued research and development efforts to meet non-destructive testing needs throughout the industrial spectrum and to maintain its position as a market-leading provider of eddy current and ultrasonic inspection equipment. Headquartered in Snoqualmie, Washington, with its centre of ultrasonic inspection excellence in Quebec, Zetec has provided solutions for mission-critical inspections for over 40 years. It is a company committed to continued research and development efforts to meet non-destructive testing needs throughout the industrial spectrum and to maintain its position as a market-leading provider of eddy current and ultrasonic inspection equipment. This story is reprinted from material from Zetec, with editorial changes made by Materials Today. The views expressed in this article do not necessarily represent those of Elsevier.